The third episode of 'Cultureshock' struggles to maintain an unbiased tone as it presents a revisionist, oversimplified account of the impact of trash TV on modern pop culture. Monday (June 9) saw the premiere of episode 3 of 'Cultureshock', a five-part documentary series from Morgan Spurlock ('Supersize Me') and Entertainment Weekly on the A&E Network. Dubbed a series that takes a look “at the untold stories behind watershed moments in pop culture that have had a lasting impact on our culture,” the show opened with an episode that took a close look at the final days of Michael Jackson and followed it up with an unfiltered look at the lasting effect of realitiy TV on the Osbournes. Monday's episode, 'The Rise of Trash TV' attempts an objective look at the sudden meteoric rise, the controversial peak and the ultimate demise of daytime talk shows on TV from the late 80s to present day. Through its narrative, it takes us back to a host of talk shows that sparked the scandalous flames of daytime TV - 'Geraldo', 'Sally Jessy Raphael', 'Maury Povich' and of course, the king of 'trash TV', 'The Jerry Springer Show'. It does this through extensive interviews with several hosts and producers of these tabloid talk-shows including the likes of Jerry Springer, Sally Jessy Raphael, Geraldo Rivera, Laura Grindstaff, Dr. Drew Pinsky, Maury Povich and more. In that context, the episode tends to impart more significance to the role that trash TV played in shaping today's cultural landscape. Obviously, things are a little more complicated than that and the episode does tend to oversimplify things to a certain degree. Nonetheless, through the first half of the episode, we see a very comprehensive history of the phenomenon that was trash TV. Starting with Phil Donahue's unique approach of getting the studio audience involved in his interviews, to the introduction of a female host in the form of Sally Jessy Raphael to the ultimate serendipitous state of affairs that led to the format of 'Springer', the episode almost feels like a Wikipedia page unfolding on film. We also get a peek at the ratings-obsessed TV industry and the moral and ethical conflict producers of shows tackled while trying to keep the numbers up. 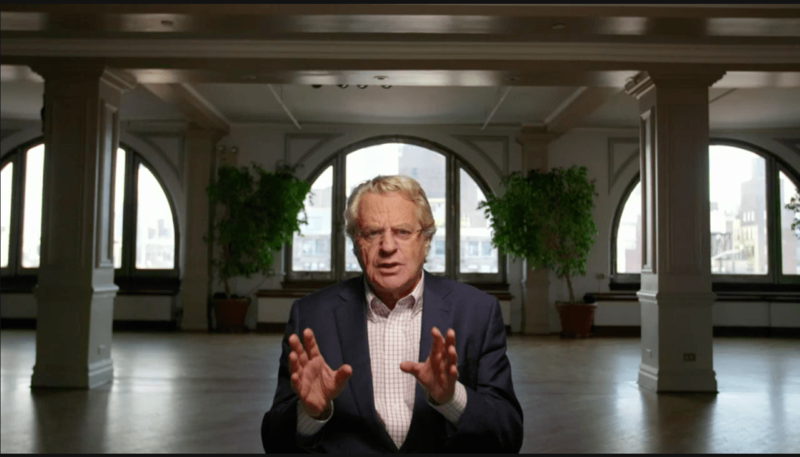 It's very interesting to see Jerry Springer unfazed, out of his usual character, as he reflects upon his legacy that spans more than a quarter century. One particularly interesting revelation deals with how The Jerry Springer show ended up with its infamous format. As the story goes, the show was about to be canceled in its early days and was pushed to a 3:00 am slot on cable TV. In a moment of hopelessness and a desperate struggle for ratings, the producers decide to go with a no-holds-barred strategy and appeal to a younger audience by discussing more controversial topics, and that launched the format that we are all familiar with today. The episode arrives just a month after Jerry Springer's final episode (re-runs of the show commenced in June). Throughout the episode, Springer remains unapologetic for all the controversy he has stirred up over the years. He presents himself as someone who was hired to do a job at a tough time and who adapted to the demand, while presenting a revisionist attitude to straddling the ethics of exploiting human-interest stories for entertainment. He makes an intriguing point to substantiate this. Springer calls television as a mirror of the masses, one that reflects our attitudes and desires. By pointing out how Springer beat Oprah during the ratings war of the late 90s, he makes a case that people are naturally attracted to that raw aggression that so often poured forth on his show. He also goes on to claim that Springer desensitized audiences by calling guests from all fringes of society, slowly lowering the bar for TV decadence. He goes on to point out how his show was one of the first to invite guests from the fringes of society, letting their bizarre stories unfold on screen for all to see. These bold claims make Springer the star attraction - or star defendant - through the hour-long episode. Compared to the previous two episodes of Cultureshock, 'The Rise of Trash TV' seems so far to have the least bit of meat in it, drawing a narrative that is grander than reality in order to put across a point. In contrast, episodes 1 & 2, 'Michael Jackson's Final Curtain Call' and 'The Osbournes: The Price of Reality' did not find the need to draw such conclusions, resting purely on the events and the style of presentation to form a compelling narrative about two very interesting milestone events in modern pop culture. Next week, 'Cultureshock' unveils its fourth episode 'Freaks and Geeks: The Documentary' which draws a profile of Paul Feig and Judd Apatow’s 1999 cult classic series and original 'dramedy'. New episodes of 'Cultureshock' are out every Monday at 9pm ET/PT on the A&E Network.